Fifteen of this year’s Rose of Tralee contestants have received an official recognition of their Irish ancestry by the Government. 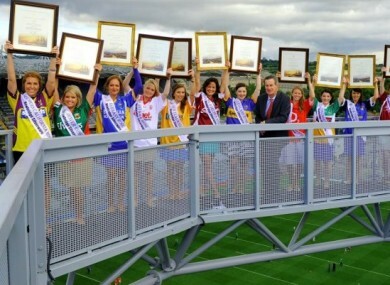 FIFTEEN ROSE OF TRALEE contestants taking part in this year’s festival have been presented with Certificates of Irish Heritage to formally mark their Irish roots. The certificate, which is signed by the Tanaiste, is as an official recognition of a person’s Irish ancestry by Ireland’s Government. Each document maps the recipient’s Irish background, displaying the name of their ancestors and the town they came from. As of July 2012, 682 certificates have been purchased and 58 have been issued as presentations or to competition winners, according to the Minister of State at the Department of Foreign Affairs Joe Costello. The first certificate to be issued was presented by the Tanaiste in September 2011 to the family of Jospeh Hunter, a New York fireman who lost his life in the terrorist attack. Since then, several other have been presented with an official recognition of Irish ancestry, including former US president Bill Clinton, US President Barack Obama, and Lord Sebastian Coe. Email “Certificates of Irish Heritage given to Roses”. Feedback on “Certificates of Irish Heritage given to Roses”.